This post is filed under Broccoli, Carrots, Chicken, Edamame, Frozen, Lean Cuisine, Microwave, Pasta, Sesame Seeds, Soy Sauce, Vermicelli. Damn! That’s as close as close can be. Very well done Lean Cuisine. 4.5 out of 5?? I think you’re being a little TOO critical here. 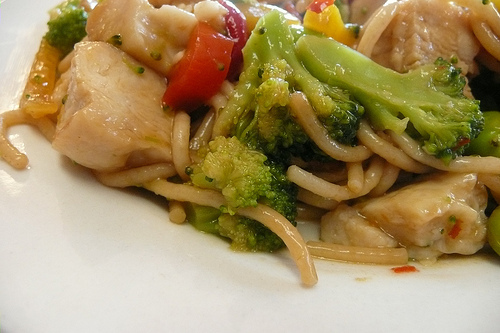 They look nearly identical–especially when compared to some of the looks of your other frozen meals. I’m surprised with the amount of vegetables being accurately represented. You gave a 5-star rating to the Hormel Meatloaf even though it had some minor inconsistencies. And looking at the box, I think the dark spots on the chicken are pepper flakes, not grill marks. at first i thought your pictures were just other shots from the box, i had to do a double take. 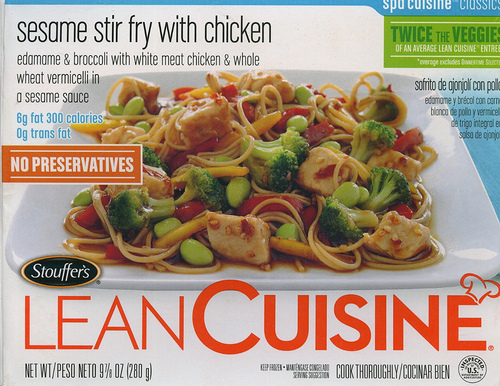 this looks really good, i’ve tried a ton of frozen stir fry/ asian cuisine meals and i almost never buy them again. 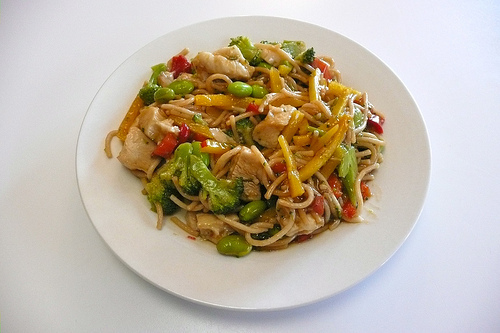 chewy, soggy chicken and flavorless veggies.